Chartered Employee Benefits’ Retirement Consultant, Carol Lenzi, CFP®, shares some tips for selecting the right Financial Planner for you. 1. Is your Financial Planner a member of The Financial Planning Institute of Southern Africa (FPI)? The FPI is a professional association to which most accredited Financial Planners belong, and your Planner should preferably be a member. 2. Is your Financial Planner a CFP® Professional or a CERTIFIED FINANCIAL PLANNER®? This internationally recognised standard for Financial Planning professionals gives you confidence that the Planner with whom you are dealing is suitably qualified and up-to-date with industry trends. There are strict requirements regarding education, experience and ethics to ensure they can provide sound and professional financial advice. Your Planner may not be a CFP® Professional, but has the relevant years of experience and knowledge, and you are satisfied with him or her. The CFP® designation is, however, a recommended requirement in the Financial Planning industry. 3. Is your Financial Planner a “tied agent” or independent? An independent Financial Planner is one not affiliated to a particular service provider. Some independent Financial Planners have preferred service providers that they partner with so that they can, for instance, tailor-make investment strategies specific to their client’s needs. A Financial Planner linked to a service provider, usually by way of licencing, is a ‘tied agent’ and can, in most cases, only provide financial solutions within that particular service provider. There is no right or wrong. Rather, consider whether you are receiving professional financial advice. 4. How experienced is your Planner? To attain the CFP® designation, an individual must have completed their Postgraduate Diploma or BCom Honours in financial planning (NQF Level 8), have at least three years’ working experience, passed the Professional Competency Exams (PCE) and be abiding by the rules and guidelines of the FPI’s Code of Ethics and Practice Standards. Ideally, you would like to engage the services of someone with a number of years of relevant practical experience. Some Financial Planners have expertise in certain fields, for example, investments or trusts; others have a good, all-round knowledge and can provide you with sound advice. Most Financial Planners, however, whether ‘tied agents’ or independent, can provide holistic advice, even if not experienced in all fields of financial planning themselves. Ask the relevant questions about their experience and abilities, and in which fields of financial advice they can advise on and operate. 5. What Financial Planning services are offered? Is your Financial Planner able to provide you with only the intangible service of ‘advice’, or are they also able to implement the documented advice provided to you, and if so, with whom will they contract to offer the recommended solution? 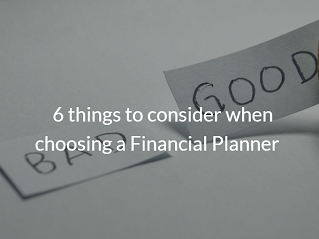 6.How will you be paying for the expertise provided by the Financial Planner? Financial Planners levy fees in different ways, understand how you will be paying for the advice and what the fee is for. Is it an initial fee or on-going fee? Is it taken as a percentage of the invested amount or as a percentage of the assets under management? Ensure that you are happy with the fee that you will be paying for the service that the Planner has committed to providing you with. Be cautious of offers for free financial planning. The Financial Planning industry is being more closely regulated, and all to the consumer’s advantage. Should you find a Planner who fulfils all your requirements, the crucial element is trust. Ensure that your Financial Planner understands your values and goals and reflects that in your planning. Read our informative blogs by clicking here.